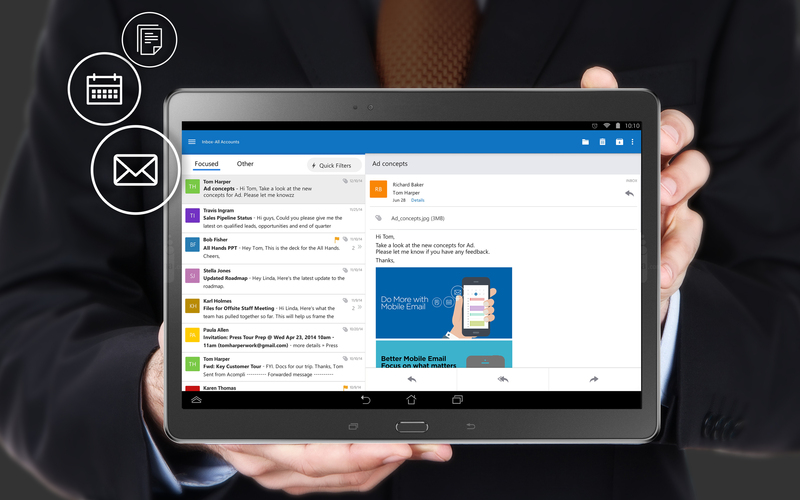 Microsoft today launched Outlook for Android and iOS phones and tablets, based on the application it acquired when it bought Acompli last December. These new applications will go live in their respective app stores over the course of the next few hours. In the long run, these new apps will replace all of Microsoft’s current (and somewhat confusing) range of Outlook-branded apps, including the Outlook.com app for Android and the rather limited OWA apps for Android and iOS that only work for paying Office 365 subscribers. Those older apps will still be available for the time being, but Microsoft tells me it plans to converge those experiences over time. The company definitely recommends that Outlook.com users on Android switch to the new Outlook app. The new applications, Microsoft’s general manager of its Office division Julia White told me earlier this week, are based on the technology Microsoft acquired when it bought the email app Acompli for $200 million last year. “We brought that team in and it’s now a core part of the our Outlook team,” she told me. It’s no surprise then that the Outlook apps will look and feel quite a bit like the original Acompli apps, too. Microsoft has already added a few minor Office-app like touches, including a colored ribbon-like UI, but if you’ve ever used Acompli’s apps, the new Outlook apps will mostly feel like a rebrand of that service. What is a surprise, though, is that Microsoft went ahead and decided to relaunch the apps under the Outlook moniker this quickly. More than anything, though, it probably speaks to how good the Acompli apps were already. In our interview, White stressed that the Outlook apps aren’t just meant for email triage. “They live up to the Outlook promise,” she told me. “The Outlook userbase will certainly be excited about this.” White also argued that most of the email clients that now ship with mobile devices are pretty basic, but “people want to do more than just basic email triage” on them. Just like Acompli before it, Outlook will support Office 365, Exchange, Outlook.com, Yahoo! Mail and Gmail, as well as most other email providers. The Outlook app also allows you to send attachments through many cloud services, including Microsoft’s own OneDrive, as well as Dropbox and others. Similar to most modern email apps, the new Outlook apps now also support various swipe gestures, which you can customize to your need. Microsoft considers today’s launch a full release of the iOS version, while the Android version is still officially in preview and not officially supported yet. The reason for that is Android’s broad hardware ecosystem. Once Microsoft gathers a bit more data about how the apps run on more real-world devices, it will make launch a fresh version of the app and announce its general availability on Android, too. If the Office for Android tablets apps are any indication, that will be about two months from now.